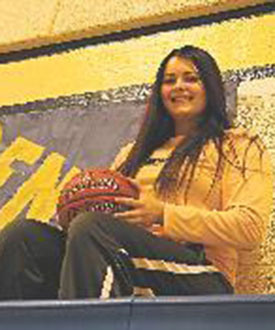 Jacqui Baker’s role as a leader on the Shenango High girls basketball team goes without saying. The only senior on the team, and with just one junior underneath her on a roster laden with sophomores and freshmen, Baker has been asked to take command in 2016-17. Baker has grown into that role and helped the Lady Wildcats forge a four-game win streak. Her efforts in the second and third games of that streak, in which she averaged 10 points and nine rebounds per contest, served to earn her New Castle News Athlete of Week honors presented by Washington Centre Physical Therapy and voted on by the New Castle News sports staff. But Rankin didn’t ignore Baker’s physical abilities on the court. At 5-foot-11, Baker stands an imposing figure in the Lady Wildcats’ frontcourt and has carved out a niche as one of Lawrence County’s best rebounders. Her ability to hit the glass and make her presence felt in the paint has helped her to average 12.8 points per game which leads the way for Shenango and places her fourth in the county. Baker started the season on fire, averaging 17.6 points per game before an ankle sprain caused her to miss Shenango’s next two games. With the team’s only senior out, and then struggling to get back to 100 percent, the Lady Wildcats started out WPIAL Section 1-2A play slowly, going 1-4 over their first five contests. The opposite has been the case since, however, as Shenango has gone 5-1 over its last six section contests with Baker as the catalyst. Baker says getting confidence back in her ankle following the injury was a major key to her improvement of late. With Baker’s Wildcats coming together and the playoffs on the horizon, Shenango sits tied for third in the section with Burgettstown (6-5, 12-6). Four teams plus ties that can’t be broken advance to the WPIAL playoffs. Shenango and Burgettstown split the regular season series.